Living a Fit and Full Life: Celebrate Summer with Rollplay's New 6V Chevy Tahoe Fire Rescue Ride On! 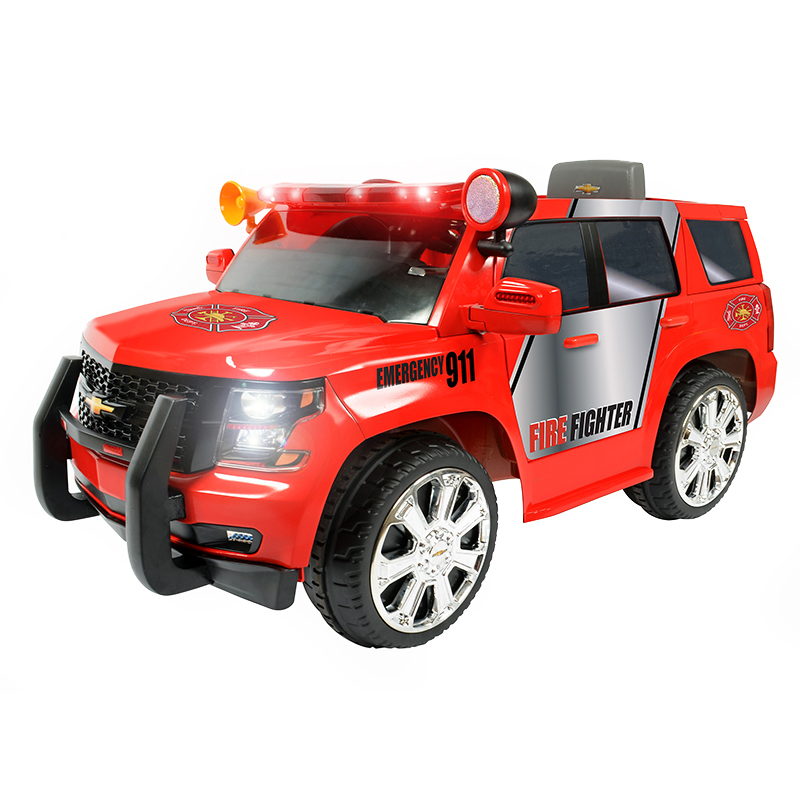 Celebrate Summer with Rollplay's New 6V Chevy Tahoe Fire Rescue Ride On! compartment, MP3 connector, no slip rubber traction slips and more! Rollplay's New 6V Chevy Tahoe Fire Rescue Ride On is awesome! With the weather beginning to warm up, we've been spending a ton of time outdoors and what better way to spend it than with this little beauty from Rollplay. I want to first give you a little background on me when it comes to toy assembly in my house. I usually avoid it at all cost and have done so pretty well as I've never had to assemble any of the bigger toys since my husband usually takes care of those. With this one I jumped right in not really sure what to expect, especially as I don't have much experience. I have to tell you I found it extremely easy to assemble and had it up and running in about 15 minutes which I was definitely praised for by the kids as they zoomed off down the sidewalk. 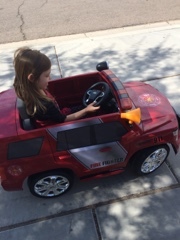 My kids have been driving this Chevy Tahoe Fire Rescue Ride On all over the neighborhood. I love that it doesn't go too fast so I can easily keep up with them on our walks. My kids love the siren and lights and often play like they're off to put out a fire. They also enjoy using the loud speaker which isn't too loud which is something I'm sure the neighbors and I can both appreciate. I also really like that it can be driven in the grass at the park and even manages to go through the gravel with ease. The battery life is also incredible which is great because it rarely dies. The battery life indicator lets you know when it's running low and we simple charge it for a bit and we're back up and running. The kids also love the the doors actually open and that they have a storage compartment to store their stuff. Another super cool feature is that the headlights actually work which has come in handy when we spend a little too much time at the park and have to drive home in the dark. There's a real working horn and an MP3 connector so kids can even jam out to their favorite music. 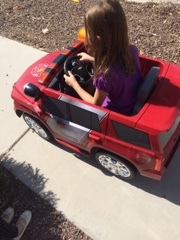 I also wanted to add that I really think kids will retain some of their driving experience for later in life when it comes time for them to really learn how to drive. My girls picked up on turning the steering wheel in the opposite direction when backing up fairly quickly. As a mom of 4 I think I'm gonna need all the help I can get when it comes time for the real driving lessons! Rollplay's New 6V Chevy Tahoe Fire Rescue Ride On is an absolute blast and would make for some incredible summer memories for kids! Click HERE to find a store near you that sells Rollplay!